You probably thought "awards season" — that three-month during which talented celebrities give each other trophies to celebrate a job well done — was over and done with after the last Oscar was handed out to The Shape of Water. Nope. On March 11, 2018, the iHeartRadio Music Awards took place in Las Vegas. Among the big winners were Ed Sheeran for song of the year (for "Shape of You") and Cardi B for best new artist, but that's far from the biggest story of the evening. The awards show is where and when Taylor Swift debuted the video for "Delicate," the latest single off her multi-platinum album Reputation. Swift seems like one of the few artists for whom a new music video is still a big deal, in part because she's so hugely popular, but also because she goes all out with her videos. From early efforts such as "You Belong with Me" to more recent work like "Bad Blood" and "Look What You Made Me Do," nearly every Swift video is a big-budget blockbuster extravaganza for the eyes and ears. Her latest, "Delicate," is no exception. Here are some things you might have missed amid all the excitement of the video debut. Swift has always followed that old dictum to "write what you know." When she started out, she wrote about sweet and sappy teenage romance, and then, when she became a star, she wrote about her feelings in and after romances with dudes such as Jake Gyllenhaal and Joe Jonas. Swift's videos are just as revelatory and introspective (and worthy of analysis) as her songs. In "Delicate," directed by frequent collaborator Joseph Kahn, Swift plays a pop star who may or may not be Taylor Swift as she deals with paparazzi, reporters, fans, and security guards. Then she discovers a talisman — a magical note — that makes her invisible. Suddenly, she can come and go as she pleases without having to be "on." She can be herself and explore what a life without fame feels like. After dancing through a bunch of set pieces (lobby, elevator, subway, street), she winds up looking into a quaint bar, as if longing for the life she wishes she had, or, in another life, could have had. This isn't a performance video, or an artsy, vague, impressionistic one. This video tells a story. It's clearly supposed to suggest Swift's mixed feelings about her experiences with art, fame, romance, and living her life under scrutiny. More specifically, this video might complete a story told piece by piece via Swift's three previous videos for the singles off of Reputation. According to a Taylor Swift superfan on Twitter with the handle @13swift1989, the story goes like this: The thesis of "Look What You Made Me Do" was "This is what you think I'm like." That was followed by the song "…Ready For It?" That was theoretically about "I'm done letting my reputation take over." Then came "End Game," with "I'm having more fun than you and living my best life." "Delicate," with Swift gallivanting in a hotel and remaining oddly unseen despite being one of the most famous people in the world, is about how, underneath the fame and fortune, she's just a person. In this video, her true essence is visible. If the video for "Delicate" is any indication, the Taylor Swift as "Unofficial Welcome Ambassador for the City of New York" era might be over. (As it should be: Her song "Welcome to New York" was on 1989 and that album is so 2014.) Taylor Swift has seemingly moved, or at least moved on, from the fascination of the concrete jungle where dreams are made of to the glossy, Hollywood-laced dream factory that is Los Angeles. 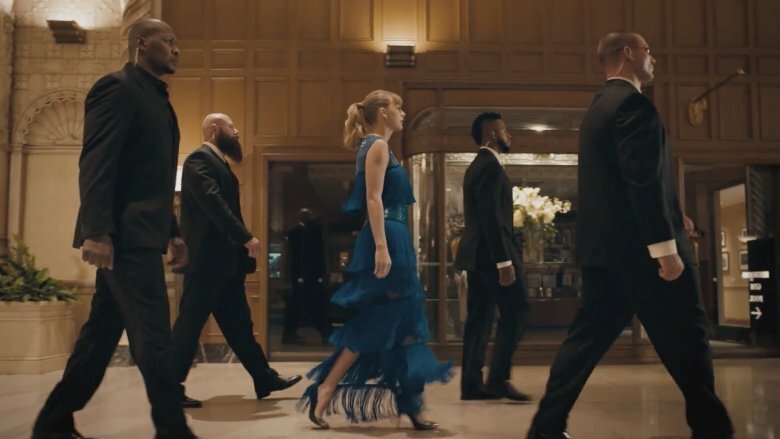 While the "Delicate" video looks like it was filmed on some sets, the majority of action takes place in and around the Los Angeles Biltmore Hotel, aka the Millennium Biltmore Hotel. That's a very fitting choice for such a personal video. The "Millennium" works because Taylor Swift is a voice of her generation, and also because it's a classy, sparkly joint. It's been around since the 1920s and is one of the oldest and grandest buildings in the L.A. area. Like the Biltmore, Taylor Swift is equally rich and fancy, but, as the video implies, beneath the surface, a normal entity with a heart. The "Delicate" video rocks a distinctive 1920s/Jazz Age feel. That's probably because so much of it takes place inside the vintage 1920s Los Angeles Biltmore Hotel. It's also because Swift rips off the bottom part of her gown at one point to transform her dress into something Daisy Buchanan would wear in one of the fancy flapper parties in F. Scott Fitzgerald's classic period novel The Great Gatsby. In that novel, the mysterious millionaire Jay Gatsby is obsessed with Daisy and her every move, which, as this video implies, isn't too different from the worldwide obsession with Taylor Swift. This isn't the only Reputation-era nod to The Great Gatsby. On the album's"This Is Why We Can't Have Nice Things," Swift sings about a party-hearty time in her life in which she was "feeling so Gatsby for that whole year." With the way the "Delicate" video plays out, that Gatsby fixation just might be over. Swift writes and sings about love and loss in a relatable way, and she lives her life out loud in such a way that whenever she drops a new album, fans and critics pick apart the songs to figure out which celebrity boyfriend each track is about. The consensus seems to be that "Delicate" is about British actor Joe Alwyn, Swift's main squeeze since 2017. The "proof": Swift has been a bit more private or "delicate" with her relationship with Alwyn as opposed to boyfriends past, plus there's a line about "the girls back home," which is notable because Alwyn is from England. Also, the line "never seen that color blue" is very likely about the blue-eyed star of Billy Lynn's Long Halftime Walk. More clues hide in the video for "Delicate." 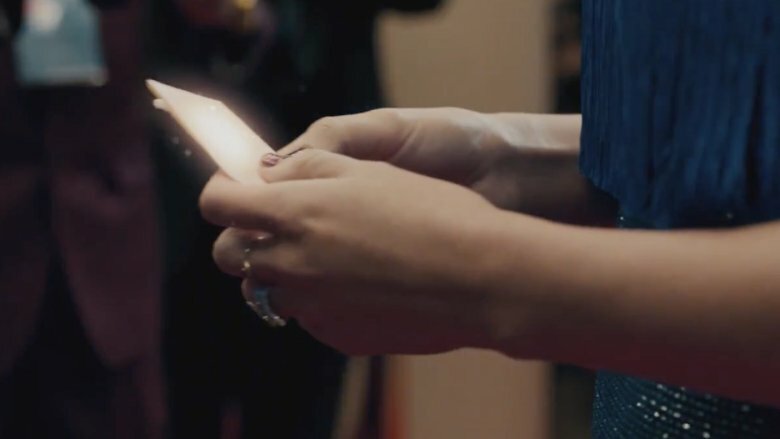 When Swift receives the magic note that makes her invisible, she is shown wearing one of her signature snake rings … on her ring finger (implying this guy might be "the one,") and at one point she glides by "Joe's Deli." Go Joe! Taylor Swift has made a lot of great songs, and she pays very subtle homage to one of them in the "Delicate" video. One of the most striking images — and themes — in the video is the cleansing power of water. 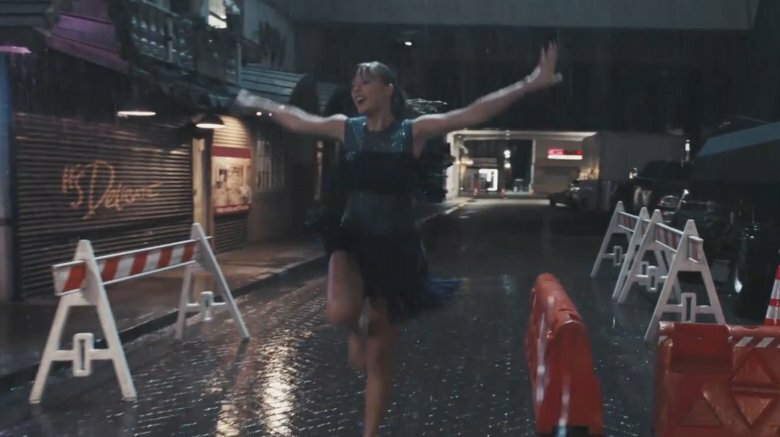 That is to say that there are several shots of Swift letting go of all that troubles her by dancing in the pouring rain. That's not the least bit subtle — water washes the bad away — but the Taylor Swift reference therein sure is. In the title track from Swift's album Fearless, she sings about a similar moment of dramatic forward momentum with the lyric, "I don't know why, but with you I'd dance in a storm in my best dress fearless." Fans noticed that in "Delicate," Swift dances in a storm in her best dress, you know, all fearless-like. And when she dances fearlessly in the subway, there's a sign noting "Track 5." Sure, that points to a train (yes, Los Angeles has subways, too), but it also directs viewers as to where to find "Delicate." It's track number 5 on Reputation.